Subscribe by email to the news of the Seismic Registry Unit will receive updated information on the seismicity of the Valencian Community and bordering provinces. Enter your email address and give the Subscribe button, you will receive an email to confirm your subscription to this free service. No Spam. GMT Time * : Universal time event. In Spain in summer standard time is GMT + 2 hours in winter standard time is GMT + 1 hour. (one hour in the Canaries). Next Monday 24 October they initiate the classes of the quoted course. 25/09/2016 Detected earthquake northeast of Fold, Murcia to the 13:28:18 GMT* of magnitude 1.5. Detected new evento the day 20/09 northwest of Alhama of Murcia. Murcia. Detected two new evento the day 14/09 northwest of Librilla, Murcia. 15/08/2016 Detected earthquake northeast of The Vall of Laguar, Alicante to the 20:02:13 GMT* of magnitude 2.1. 20/08/2016 Detected earthquake northeast of Cieza, Murcia to the 07:20:36 GMT* of magnitude 1.8. 22/08/2016 Detected earthquake southwest of Torrevieja, Alicante to the 06:38:54 GMT* of magnitude 2.4. 22/08/2016 Detected earthquake south of Barxeta, Valencia to the 16:24:05 GMT* of magnitude 1.9. 12/08/2016 Detected earthquake northwest of Alicante, Alicante to the 05:35:49 GMT* of magnitude 1.8. 12/08/2016 Detected earthquake northeast of Librilla, Murcia to the 00:59:26 GMT* of magnitude 1.5. 11/08/2016 Detected earthquake to the East of The Campello, Alicante to the 11:43:57 GMT* of magnitude 2.0. 07/08/2016 Detected earthquake south of Murcia, Murcia to the 01:38:04 GMT* of magnitude 1.5. 02/08/2016 Detected earthquake southeast of Benifallim, Alicante to the 19:01:39 GMT* of magnitude 2.0. 31/07/2016 Detected earthquake northwest of Busot, Alicante to the 11:03:34 GMT* of magnitude 1.6. 29/07/2016 Detected earthquake southwest of Alcoy, Alicante to the 19:53:22 GMT* of magnitude 2.0. 29/07/2016 Detected earthquake northeast of Miramar, Valencia to the 03:43:17 GMT* of magnitude 1.6. 24/07/2016 Detected earthquake southeast of Santa Pola, Alicante to the 15:23:36 GMT* of magnitude 1.6. 24/07/2016 Detected earthquake southeast of Valencia, Valencia to the 01:48:47 GMT* of magnitude 1.7. 11/07/2016 Detected earthquake north of Caudete of the Fuetners, Valencia to the 11:15:34 GMT* of magnitude 1.9. 10/07/2016 Detected earthquake southeast of Fold, Murcia to the 11:56:33 GMT* of magnitude 2.1. 10/07/2016 Detected earthquake to the Gulf of Valency to the 02:43:12 GMT* of magnitude 1.9. 10/07/2016 Detected earthquake in the Gulf of Valency to the 01:42:01 GMT* of magnitude 2.1. 07/07/2016 Detected earthquake to the East of Torrevieja, Alicante to the 22:01:52 GMT* of magnitude 1.8. 06/07/2016 Detected earthquake southeast of Totana, Murcia to the 04:14:15 GMT* of magnitude 2.5. 04/07/2016 Detected earthquake northeast of Sollana, Valencia to the 21:09:54 GMT* of magnitude 2.0. 04/07/2016 Detected earthquake northeast of Swedish, Valencia to the 20:16:16 GMT* of magnitude 2.9. 25/06/2016 Detected earthquake to the East of Torrevieja, Alicante to the 04:02:01 GMT* of magnitude 1.8. 23/06/2016 Detected earthquake southeast of Torrevieja, Alicante to the 04:14:15 GMT* of magnitude 2.5. 15/06/2016 Detected earthquake south of Murcia, Murcia to the 04:02:01 GMT* of magnitude 1.8. 08/06/2016 Detected earthquake west of Alhama of Murcia, Murcia to the 01:50:39 GMT* of magnitude 2.5. 06/06/2016 Detected earthquake northeast of Utiel, Valencia to the 20:45:50 GMT* of magnitude 2.5. 24/05/2016 Detected earthquake south of Murcia, Murcia to the 01:42:33 GMT* of magnitude 2.1. 20/05/2016 Detected earthquake to the East of Guardamar of the Safe, Alicante to the 10:38:58 GMT* of magnitude 2.5. 19/05/2016 Detected earthquake west of Tower-Pacheco, Murcia to the 05:09:32 GMT* of magnitude 1.8. 12/052016 Detected earthquake southwest of Sax, Alicante to the 19:20:56 GMT* of magnitude 2.2. 06/052016 Detected earthquake to the East of Santa Pola, Alicante to the 12:05:08 GMT* of magnitude 2.1. 05/05/2016 Detected earthquake to the East of Santa Pola, Alicante to the 09:1:08 GMT* of magnitude 2.3. 05/05/2016 Detected earthquake northwest of Santomera, Murcia to the 23:19:31 GMT* of magnitude 1.6. 29/04/2016 Detected earthquake in Mediterranean, Cape of Sticks to the 12:07:33 GMT* of magnitude 1.8. 26/04/2016 Detected earthquake northwest of Torrevieja, Alicante to the 02:34:51 GMT* of magnitude 1.6. 26/04/2016 Detected earthquake northwest of Alhama of Murcia, Murcia to the 22:31:07 GMT* of magnitude 1.8. 22/04/2016 Detected earthquake to the East of Totana, Murcia to the 06:08:14 GMT* of magnitude 2.4. 20/04/2016 Detected earthquake to the East of Santa Pola to the 23:09:39 GMT* of magnitude 2.1. 16/04/2016 it Has occurred an earthquake in the coast of Ecuador to the 23:58:39 GMT* of magnitude 7.2. Source of the parametros of location: National Geographic Institute. 17/04/2016 Detected earthquake to the East of The Campello, Alicante to the 21:56:40 GMT* of magnitude 1.9. 17/04/2016 Detected earthquake southeast of The Campello, Alicante to the 11:02:32 GMT* of magnitude 1.9. 17/04/2016 Detected earthquake northeast of Saltworks, Alicante to the 08:35:59 GMT* of magnitude 1.6. 16/04/2016 Detected earthquake to the East of Fontanars dels Alforins, Valencia to the 03:35:08 GMT* of magnitude 1.5. 14/04/2016 Detected earthquake south of Murcia to the 09:51:10 GMT* of magnitude 1.5. 10/04/2016 Detected earthquake southeast of Yecla, Murcia to the 07:15:22 GMT* of magnitude 2.0. 31/03/2016 Detected earthquake southeast of Utiel, Valencia to the 20:37:35 GMT* of magnitude 2.9. 01/04/2016 Detected earthquake northeast of Requena, Valencia to the 08:57:23 GMT* of magnitude 2.7. 21/03/2016 Detected earthquake southwest of Crevillente, Alicante to the 00:28:34 GMT* of magnitude 1.9. 19/03/2016 Detected earthquake to the East of Barxeta, Valencia to the 04:35:35 GMT* of magnitude 1.5. The serié seismic of Alborán, to which referred us in our news of 25 January states until the moment of 1800 earthquakes of upper magnitude to 1.5. The last significant evento registered has occurred the past morning to the 4:40 GMT. His magnitude has been of 5.1 and has been felt with intensity IV so much in Melilla as in some places of the province of Málaga. 04/03/2016 Detected earthquake southeast of Catadau, Valencia to the 19:26:18 GMT* of magnitude 2.3. 06/03/2016 Detected earthquake southeast of Sagunto, Alicante to the 13:48:32 GMT* of magnitude 2.4. 06/03/2016 Detected earthquake northeast of Beneixama, Alicante to the 19:24:28 GMT* of magnitude 1.6. 04/03/2016 Detected earthquake west of Banyers of Mariola, Alicante to the 04:33:21 GMT* of magnitude 2.2. 27/02/2016 Detected earthquake to the East of Santa Pola, Alicante to the 18:02:23 GMT* of magnitude 2.6. 26/02/2016 Detected earthquake to the East of Ondara, Alicante to the 13:04:35 GMT* of magnitude 2.0. 26/02/2016 Detected earthquake in west of Benasau, Alicante to the 08:30:17 GMT* of magnitude 1.9. 19/02/2016 Detected earthquake in the Mediterranean-Cape of Sticks to the 10:49:59 GMT* of magnitude 2.3. 07/02/2016 Detected earthquake southeast of Fenced, Valencia to the 10:13:56 GMT* of magnitude 2.0. 29/01/2016 Detected earthquake in the Gulf of Valency to the 10:56:49 GMT* of magnitude 1.5. 25/01/2016 Along the month of January is producing a series of earthquakes west of Melilla. In particular from the day 21 have produced 90 earthquakes of upper magnitudes to 1.5 standing out the one of magnitude 6.3 occurred to the 04:22:00 GMT of the 25/01/2016. 20/01/2016 Detected earthquake northeast of Saltworks to the 00:44:30 GMT* of magnitude 1.6. 10/01/2016 Detected earthquake in the Gulf of Valency to the 12:53:54 GMT* of magnitude 1.6. 05/01/2016 Detected earthquake southwest of San Miguel of Saltworks, Alicante to the 05:46:41 GMT* of magnitude 1.5. 19/12//2015 Detected earthquake northwest of Crevillente, Alicante to the 15:47:21 GMT* of magnitude 3.4. 19/12//2015 Detected earthquake southeast of Hondón of the Friars, Alicante to the 15:02:43 GMT* of magnitude 2.0. 17/12//2015 Detected earthquake to the East of Torrevieja, Alicante to the 09:26:41 GMT* of magnitude 1.7. 15/12//2015 Detected earthquake northeast of Torrevieja, Alicante to the 00:41 GMT* of magnitude 1.5. We have received notifications that it has been felt in the zone epicentral. The course will be held from September 26 to October 3, 2015, more information. The offer of this course aims at training students in the basics of induced seismicity and its incidence in the Iberian Peninsula. Topics of interest including the Fracking, gas in underground storage and the prediction of strong seismic events will address. The course will take place on October 10 and October 17, 2015, more information. Both have been felt in the epicentral area. 11/06/2015 detected two earthquakes North of Buñol, Valencia. 15/05/2015 detected two earthquakes in the North-East of Cieza, Murcia. 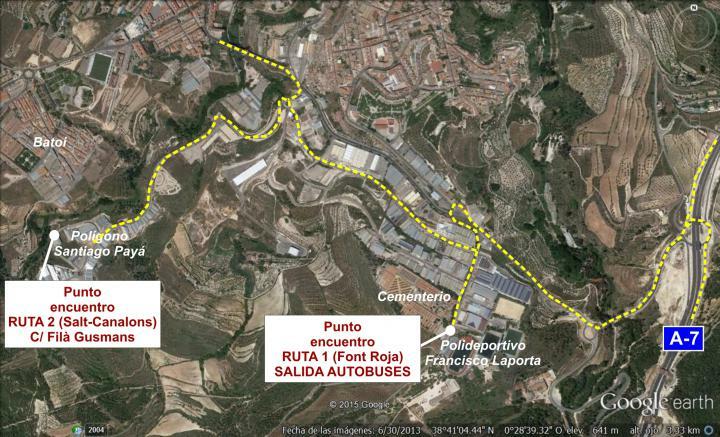 This Sunday, may 10th is celebrated in Alcoy Geolodía. The weather forecast is excellent and provides a magnificent day for walking through the field. There are two routes for different audiences: route 1. Font Roja. PUBLIC family and route 2. The Salt-Canalons. HIKERS. 01/03/2015 yesterday at 19:46:21 GMT * held a replica of the seismic series of Ossa de Montiel with a magnitude 2.7, the earthquake was felt in the epicentral area according to data published by IGN. The earthquake was widely felt. 10/02/2015 detected two earthquakes North of Totana, Murcia. 01/02/2015 detected two earthquakes North of Totana, Murcia. At 28:29:01 GMT * earthquake of mangitud 1.6 northeast of San Fulgencio. 21:20:54 GMT * earthquake of mangitud 1.7 North of Guardamar del Segura. 21:06:49 GMT * earthquake of mangitud 1.7 northeast of San Fulgencio. 18:50:41 GMT * an earthquake of magnitude 1.7 northeast of San Fulgencio. 17:36:33 GMT * an earthquake of magnitude 2.2 southwest of Santa Pola. 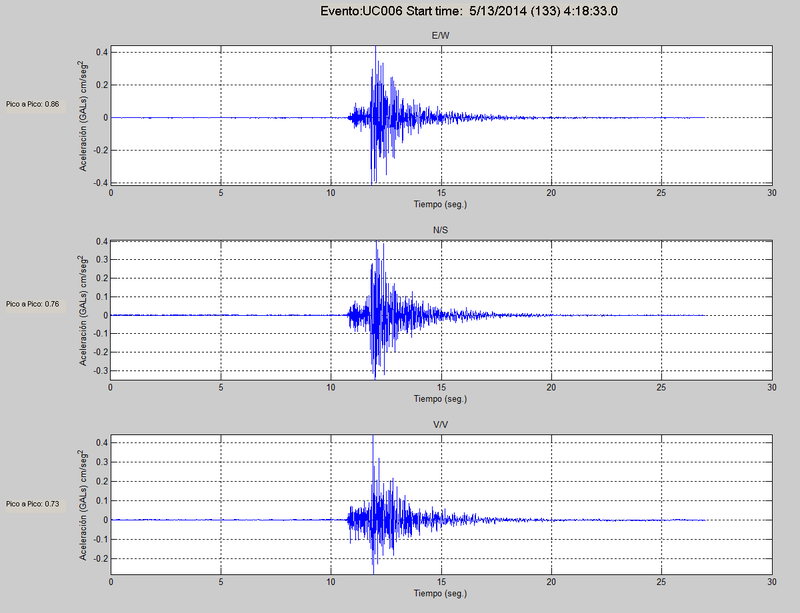 28/10/2014 detected earthquake to the West of Alhama de Murcia, Murcia 20:07:29 GMT * magnitude 1.5, followed by three replica of magnitude 1.0, 1.3 and 1.4. Both have been felt in: Crevillente, Hondón de os Frailes and Hondón de las Nieves according to data published by the I.G.N. Levante EMV newspaper interview to record seismic Dr. José Juan Giner Caturla Unit Director during the days of evaluation and intervention of damage by earthquake. 66 events seismic in the area of Montellano, Sevilla, according to data published by the National Geographic Institutehave been detected from April 20 to August 23, 2014. The largest of these 4.5 magnitude occurred last Tuesday, August 19 at 13:38:24 GMT *. View it in Google Earth. View it on a map from Google Maps. Do you know GeoAlicante? His Facebook page is a meeting point where you can find information about: geology of the province of Alicante. Geological heritage of Alicante. Alicante geodiversity. 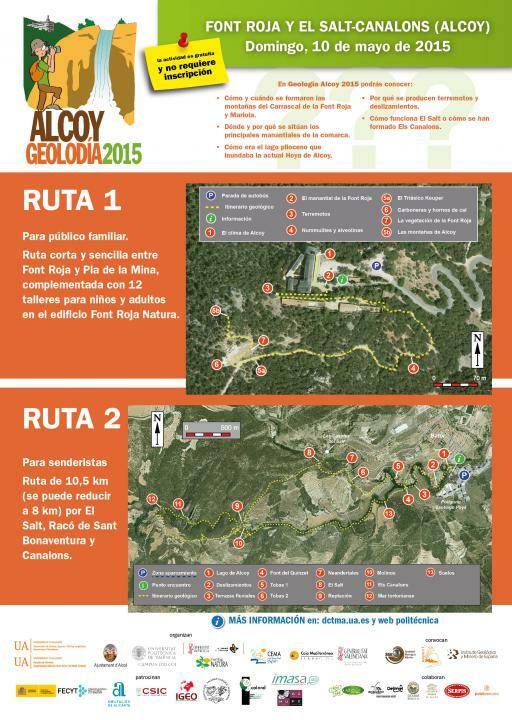 Olympics of geology of the University of Alicante. Geoyinkana of the University of Alicante and the Earth Sciences. Felt in the area of Las Salinas and Elche according to data published by I.G.N. and forms received through this website. He has been published in the section reports and publications of interest the report prepared by the Instituto Geográfico Nacional on seismic activity in the Gulf of Valencia and its relationship to gas Beaver project. Detected 6 seismic events North of Guardamar in the vicinity of San Fulgencio, Guardamar and Santa Pola. 21:21:26 GMT * earthquake of mangitud 1.6 northeast of San Fulgencio. 02:23:42 GMT * earthquake of mangitud 1.5 North of Guardamar del Segura. The registered acelerogram was published in the section of Accelerograms 2014. 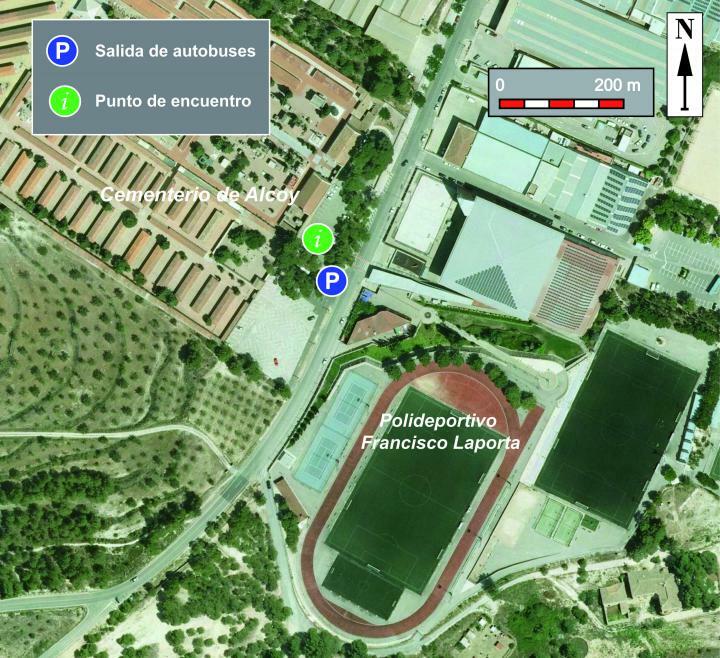 The next Sunday, May 11 held the 7th Edition of GEOLODÍA ALICANTE. It is an activity with a free-form, free and requires no registration. 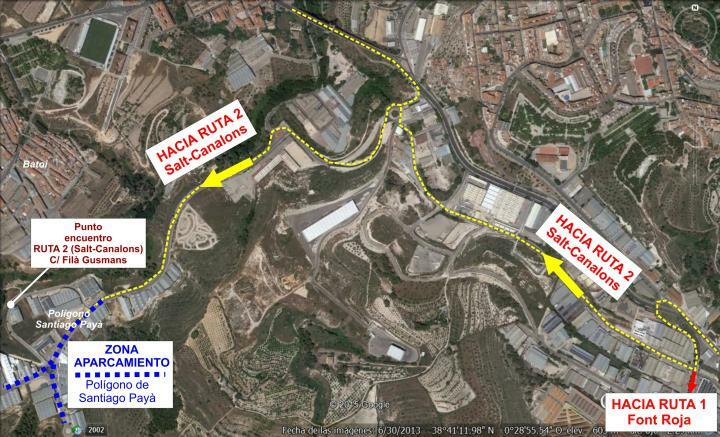 It runs in Orihuela and its mountains, walking by rocks from an ancient sea more than 200 million years. 01/04/2014 earthquake in the North of Chile at 23:46:49 GMT * of 8.3 magnitude, has been registered by seismic station located in la Font Roja Alcoy. Source of location parameters: Instituto Geográfico Nacional. Detected 6 seismic events in Medio Vinalopó, in the vicinity of Agost, Monforte del Cid, Novelda and Petrer. 21:28:58 GMT * an earthquake of 2.3 magnitude northeast of Monforte del Cid. 21:56:55 GMT * an earthquake of magnitude 2.2 southwest of Agost. 22:02:42 GMT * an earthquake of 2.3 mangitud northeast of Monforte del Cid. 23:25:00 GMT * earthquake of mangitud 1.8 Southwest of Agost. 01:48:15 GMT * a terermoto mangitud 2.4 Southeast of Petrer. 07:14:45 GMT * an earthquake of magnitude 1.6 to the East of Monfote of the Cid. The earthquake has been felt in Crevillent according to data published by I.G.N. and forms received through our website. Thanks to all users who reported collaborating. Already available on the web Map of seismicity Instrumental de Valencia updated to November 2013. National Geographic Institute has posted very useful information that shows graphically and concisely to do in case of earthquake. The national geographical Institute facilitates timely up-to-date information on activity seismic and volcanic iron at this link. 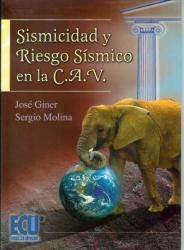 Link to information on the seismic Torreperogil-Sabiote series, promptly updated information.